In most of my fused glass pendants I use multiple layers of dichroic glass arranged to provide depth and interesting textures as one looks at and into the pendant. 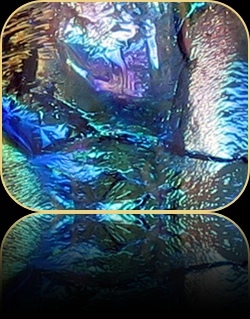 The graphic image shown here is an enlarged detail image of one of my pendants. Dichroic glass came on the scene when NASA required a special, non-glare coating for space ship windows and helmets. To meet the need, glass manufacturers borrowed from a method of coating glass with very thin layers of metal oxides (gold, silver, titanium, chromium, aluminum, zirconium, magnesium) that had been developed in Germany more than 100 years before. Because of the unique reflective/refractive properties of this glass, artists quickly adopted it for their own explorations. Depending upon the types of glass and the techniques used, light will either pass through or be reflected. In a pendant, an array of vivid and changing colors becomes visible as the pendant moves and changes angle with the available light. Creating with dichroic glass requires that three things harmoniously blend...knowledge of the nature of the glass itself, some artistic or design sense, and the "magic that happens in the kiln." Tiny little variations in what goes into the kiln can make quite dramatic differences in what comes out. And that is part of the joy of this process for me. Due to these variations in the firing process, individual results can never be exactly reproduced. No two pieces are ever exactly alike.